I always pride myself on making the girls’ birthday cakes myself every year, and no cake is too big a challenge! Here’s how you can do this one from the comfort of your own kitchen! So, you’ve got all of your bits, time to get down to the cake business! For Olivia’s birthday, I baked the cake the night before, and then decorated it the morning of her birthday, giving the cake time to cool in the fridge and be easier to work with. You can decorate the cake the same day, but just make sure it’s cooled enough not to wreck the icing! 1. Pre-heat the oven to gas mark 5/190 degrees C.
2. Grease your tins with some greaseproof paper, spreading the butter all around the inside of the tins. 1. Put 8oz of butter into a large mixing bowl. 2. Add 8oz of caster sugar and mix well until the butter and sugar cream together. 3. Add the 4 eggs and mix these in. 4. Slowly pour in the 8oz of flour using a sieve, mixing it in stages until there is none left to pour in! 5. Add a teaspoon of vanilla essence and mix it again. 6. Pour the mixture equally into the two cake tins, spreading it as evenly as possible. 7. Pop the tins into the oven, on the same shelf (and if they don’t fit, you’ll have to do them one at a time as they can’t go on top of each other in the oven! ), and check back in about 25/30 minutes. You’ll know they’re done when the cake has risen nicely, and you can stick a knife in the middle of the sponge and it comes out clean! 9. Once cooked, place the halves onto a cooling rack. 10. Once cooled, take a long knife and even the tops of the cake-halves. 1. Make a buttercream using the butter and icing sugar. You may need more or less depending on how much you want inside the cake, but you’ll be using it for the outside of the cake too. Always make sure you have twice as much sugar as butter to get the right taste and texture. 2. Spread the buttercream onto one half of the cake. 3. Spread the jam onto the other half of the cake, and gently place the buttercream half on top of the jammy half! 4. Leave this in the fridge for a little while to cool and set the buttercream. 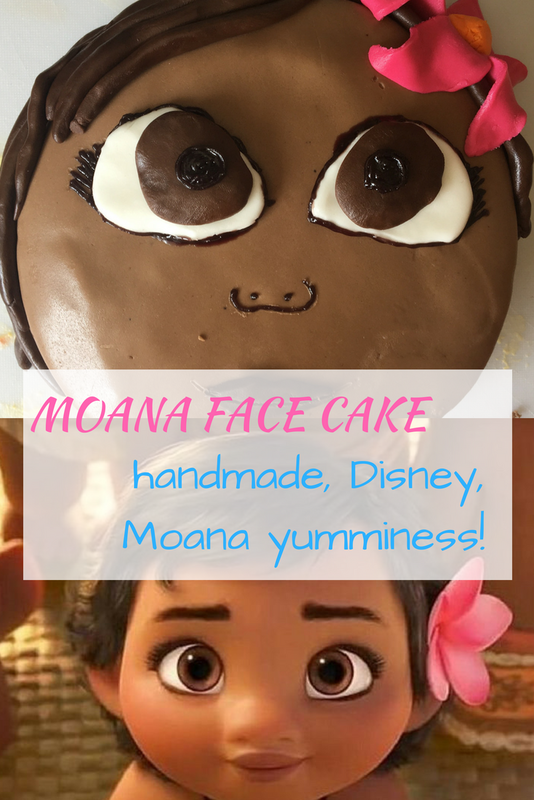 While the cake is cooling, you can prepare some of the features of Moana’s face – her eyes, the flower in her hair, her lips, and even her hair! 1. Prep your work surface by sprinkling some icing sugar down to work with. 2. Make two balls (the size of a Brussels sprout each) of white fondant by rolling them in your hands. 3. Roll the balls out on the surface until they are about half a cm thick, keeping them in the shape of how you want Moana’s eyes to look. 4. 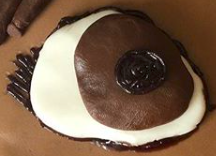 Repeat with brown icing to get her irises, then fix these on top of the white icing shapes with a bit of buttercream. 5. Use the black icing pen to draw on Moana’s pupils. 6. Pop them on a small plate and put them in the fridge for the black icing to set – you don’t want the pupils to run into the white fondant! 1. Make 5 flower petals by rolling small balls (again the size of a Brussels sprout each!) of the pink fondant icing in your hands. 2. Roll the fondant out on the surface until it’s about half a cm thick again, and, using a small knife or cake tool, make petal shapes out of the fondant. Repeat this until you have 5 petals. 3. Prop the petals up on a plate, curving the petals if you want to, and pop them in the fridge to set. 4. For the centre, roll a small ball of orange icing in your hands, flatten the top, and insert a cocktail stick through the bottom, so that it almost looks like a drinks umbrella! 5. When you’re ready to attach the flower to the cake, affix the petals first using small amounts of buttercream, then place the cocktail stick through the cake in the centre of the petals. 1. Roll a small ball of brown icing out onto the surface and cut out a lip shape. 2. Indent a lip line in the middle of the shape – you don’t want two separate lips to fiddle about with! 1. Take larger chunks of brown icing and roll them into sausages that will fit around Moana’s face. 2. Roll these into a mixture of sizes to use for her fringe, tufty bits and the rest of her hair. You will need quite a few to layer these up. 3. Leave these ones out of the fridge! You need the hair to stay soft and easy to mould. 1. Spread buttercream evenly over the entire surface of the cake. 2. Roll out brown and white icing – you will need a fair amount. 3. Mix the white icing in with the brown icing to lighten the colour of Moana’s skin. Knead the colours together and add as much or as little as you want. 4. Once you have the perfect colour, roll the icing out onto surface. You will need to lift the icing up and turn it to prevent it sticking. Use more icing sugar on the surface if necessary! 5. Make sure the icing will cover the whole cake – you can pick it up and test it by holding it over the cake. Once you have enough, lay it gently on top of the cake and flatten the sides down with your hands, cutting away any excess. 6. Gently rub the top of the cake in a circular motion to flatten any air bubbles. 7. First, add the eyes and lips. Use a small amount of buttercream to fix them to the top of the cake. 8. Add the hair next, using little drops of water on the hair to fix them to the cake. The can be moulded around the cake fairly easily, layering them up and creating her fringe. This works best if the hair strands are not put into the fridge as they need to be easily pliable. 10. Use a black icing pen to draw on the nose, eyelashes and any other features! You’ve done it! 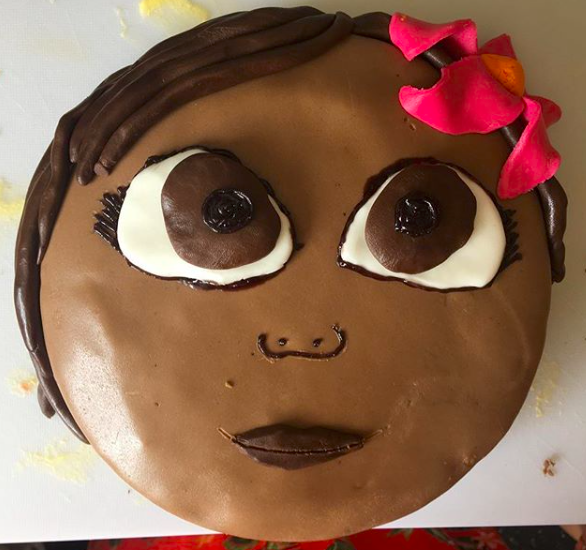 Successfully made a cake like Moana’s face! This looks fab! Thanks for linking up with #KCACOLS, look forward to you joining us again soon. Haha thank you! My little girl was quite surprised by it!